Jim DiGriz is caught during one of his crimes and recruited into the Special Corps. Boring, routine desk work during his probationary period results in his discovering that someone is building a battleship, thinly disguised as an industrial vessel. In the peaceful League no one has battleships anymore, so the builder of this one would be unstoppable. DiGriz’ hunt for the guilty becomes a personal battle between himself and the beautiful but deadly Angelina, who is planning a coup on one of the feudal worlds. DiGriz’ dilemma is whether he will turn Angelina over to the Special Corps, or join with her, since he has fallen in love with her. 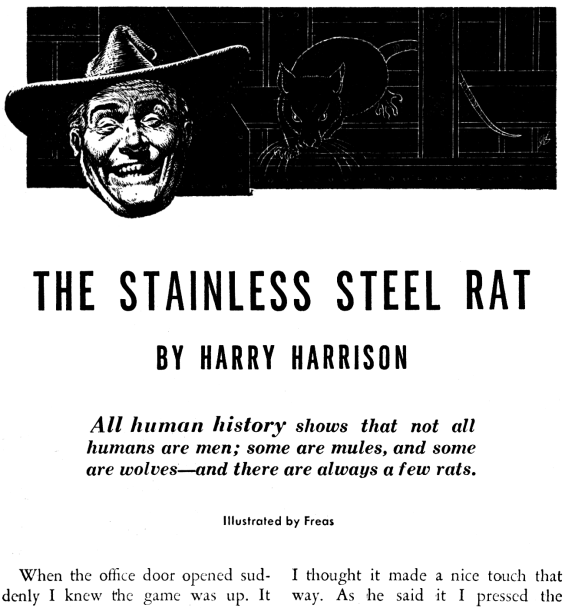 As I write this dilatory review of Harry Harrison’s The Stainless Steel Rat I am just a few minutes away from finishing the follow up, The Stainless Steel Rat’s Revenge. Thus I feel doubly guilty. For while the intellectual mulling over of a book is a natural part of the reviewing process – it is but certainly ungenerous to actually begin the sequel without having delivered the original its full due. Worse, listening to this lightweight series is very much like gobbling down fisfull after fistful of a delightful confection – I am enjoying it immensely but can`t say it is particularly good at nourishing my intellect. The Stainless Steel Rat very much deserves its due! The Stainless Steel Rat is a rollicking first person perspective adventure set amongst the resplendent plenitude of an interstellar empire. Slippery Jim DeGriz, our convivial protagonist, has a heart half filled with the milk of human kindness and half filled with a contempt of rules and rituals that the social contract requires of him. Thus he is a both anti-hero and hero, and twice as virtuous in his roguish thievery. 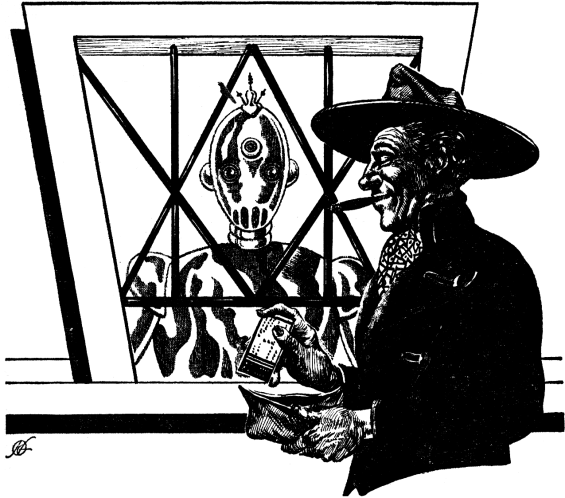 In this, his first recorded adventure, Slippery Jim outlines the shape of his variegated and thoroughgoingly criminal career thus far, is quickly inducted into a corps of criminal conspirators that`s working for the galactic government (it`s funded by bank robberies), and falls in love (with a mortiferous murderess). 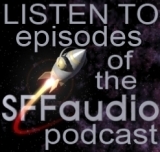 The adventure is slick, quick and comic – the many scenes composing the plot are portrayed in an almost cartoonish manner (in the best possible sense of that term). And when Slippery Jim finally catches the arch-criminal he`s after – the plot follows the centuries old axiom of ìt takes a thief to catch a thief – and Slippery Jim finds that Angelina, his Lady MacBeth, is no fan of the milk of human kindness, thinking it rather distasteful stuff. Narrator Phil Gigante reads the first person perspective tale with a transparency that`s expected of a professional narrator – his wry delivery follows the text, and gently brushes the voices of all the other speaking characters with the aural equivalent of a glistening gloss. 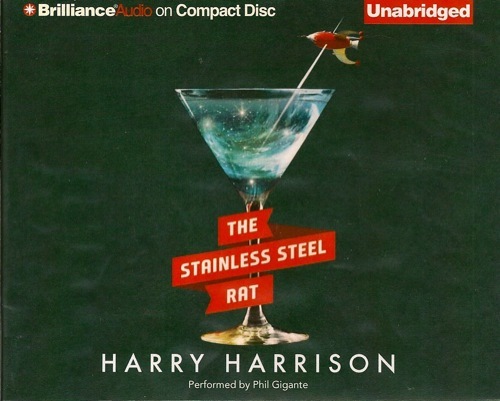 This is the first audiobook publication of The Stainless Steel Rat, which was first published in its complete form nearly 50 years ago. The audiobook is an utter delight, being fun and funny, short, to the point, and utterly, utterly consumable. Highly recommended!